Available in: Right and left hand. Stock shaft: Burner 2.0 Superfast 85 (steel), Superfast 65 (graphite). Ideal For: Mid to high handicappers. But that's not to say low-handicappers can't like them. Dustin Johnson gets on with them just fine. Briefly: An incredibly advanced iron that will blind you with science you may or may not understand and appreciate. You'll probably enjoy the results though. Every new Burner 2.0 iron has been engineered to be long. The face is thinner. The toplines are progressive. The shafts are specifically designed for each head. COR and MOI ratings have been maximized. And every iron has consistent distance gaps from one to the next. We took the #1 selling iron and made them even better. Every iron has a different face thickness. The thinner the face, the more ball speed and distance the iron can produce - incredibly important for long irons. The Burner 2.0 irons have perfect distance gaps from one iron to the next, because we tuned the loft of every head and the length of every shaft for each individual iron. The irons have been uniquely tuned to produce a sound to match the power (feel) of each club. Every Burner 2.0 iron has its own weight distribution. And every club has been shaped differently, so we've repositioned and reshaped the Inverted Cone behind every face to maximize distance and forgiveness. Because every iron has a different task we have shaped each iron differently - larger heads for long irons, more compact heads for scoring clubs. The sole of each iron has been shaped to reduce turf resistance to achieve the perfect balance between sole geometry and performance. Lastly, every Burner 2.0 shaft has a different kick point - the longer the iron the lower the kick point. When the original Burner iron appeared in January 2009, it came with bloated claims about redefining the 'set'. Quite what was wrong with the 'set' wasn't immediately clear, but it seemed our existing irons possessed the wrong swingweight, were the wrong length, had faulty lie angles, an incorrectly- positioned center of gravity (CG), inappropriate shafts, and unsuitable grips. Really, it's a wonder how anyone ever managed to hit a decent shot. 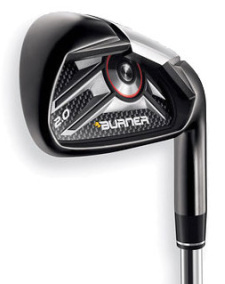 I dismissed it all as marketing hyperbole and thought that, while the TaylorMade (owned by Adidas) marketing machine would ensure healthy enough sales, the Burner iron would turn out to be just another well-conceived, but largely forgettable, club. Instead, a flurry of five-star reviews helped make it the number one-selling iron in the game. Just a year and a half later, the Carlsbad-based company introduced its successor, the Burner 2.0 whose bullet point list of technological features actually puts its predecessor's to shame. But the question I ask every time a manufacturer launches a new club it claims to be the longest and straightest the game has ever seen, is; 'Hang on, didn't you say that about your last club which you launched just a few months ago? Can it really be that much better? And would an amateur golfer who doesn't practice eight hours a day, or hit the sweetspot every time, notice any significant difference between the two clubs? (okay, that's three questions). Take an average bogey golfer. With his inconsistent swing and limited golfing time, would the vibration-management system, or repositioned CG, or multi-functional sole design, or strategically-located inverted cone, or varying shaft kick-point location, or unique COR values, or optimally-shaped and sized heads, or varying top-line widths actually mean anything? Without sophisticated launch monitors and distance-measuring equipment, would he be able to discern what this club was or wasn't doing for him? With thoughts like these bouncing around in my head, I took the Burner 2.0s to Arizona recently not entirely convinced they would perform any differently to the multitude of other top-notch irons already on the market. And could it possibly be better than the original Burner? Before you can measure performance, you need to assess the look of the club - if you don't like the shape, color, or graphics, chances are it's not going to work for you. The Burner 2.0 is obviously a game-improvement model, but the R&D people did a good job fitting all the technology into what is actually a fine looking head. The blade devotee will likely baulk at the offset (1mm in the lob wedge up to 6.5mm in the 3-iron) and all the techy stuff going on round back, but the average golfer should feel comfortable with a Burner 2.0 up behind the ball. The heads have a silver/gray face, and are black in the back, heel and toe which has the effect of making the clubhead look a little smaller than the corresponding iron in the original Burners - something that won't appeal to everybody, but which undeniably gives the new club a smoother, sleeker finish. My first shot with a Burner 2.0 was an uphill 6-iron from about 165 yards to a pin tucked behind a bunker short and right of the green. I made far from perfect contact but was pleasantly surprised to watch the ball rise and drop just the other side of the sand, about 30ft from the hole. I felt sure that wouldn't have happened with my own set (Cleveland TA7s - yes a bit old, but I like them). At the 6th, I hit a 9-iron from about 135 yards (a few more than I would get from my own 9-iron) that stopped abruptly 15 feet right of the cup. At the 9th, a 200-yard Par 3 with the pin near the front, my not-quite-solid 4-iron came up a yard or two short of the green. This continued for the next three days - instances where I'd certainly be aware of a little extra yardage. I'm probably too inconsistent a ball-striker nowadays to say much about whether or not the CG location made much difference, but I would say the 4-iron was pretty easy to get up in the air - not quite as easy as a hybrid club with similar loft perhaps, but markedly easier than my Cleveland 4-iron. The short irons did penetrate a little better because of the higher CG which I think is preferable to a high, floaty shot that's at the mercy of the wind. I had a little trouble hitting intentional hooks and slices when I landed behind a large saguaro, but minor fades and draws are certainly possible. No doubt about it, the Burner 2.0 is a fabulous club. If I owned a set of Burners, I might not be in any great rush to upgrade, but if my existing set of irons was beginning to look a bit dated, I would hope there was enough cash left in the golf equipment budget to afford a set of 2.0s. Typically they are selling for $699.99 (steel shaft) which strikes me as a great deal for so technologically-advanced a club. TaylorMade came out with a ball (Penta) that seeks to do all things for all golfers, and the Burner 2.0 perhaps tries to be the iron equivalent. No, it might not excite golfers who adamantly refuse to consider anything but the understated elegance of a blade, but for the vast majority of golfers the Burner 2.0 should make the game significantly more enjoyable.